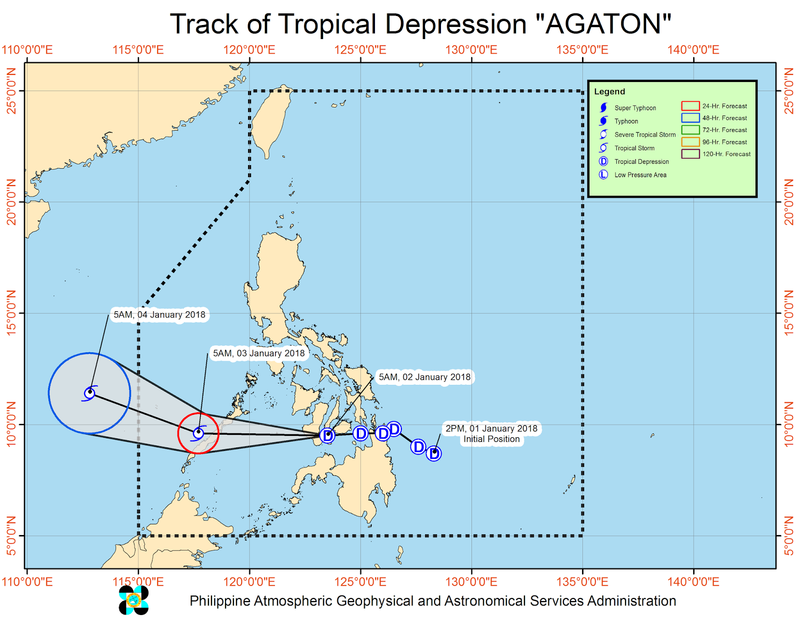 MANILA, Philippines - PAGASA issued the latest weather update on Tropical Depression 'Agaton' or Bagyong 'Agaton' at 8:30 AM, January 2, 2018 (Tuesday). Tropical Cyclone Warning Signal No. 1 (TWCS) is raised in nine (9) areas. As per the administration's latest update, 'Agaton' is now over Southern Negros Oriental. At 8:00 AM today, the center of Tropical Depression 'Agaton' was estimated based on all available data at 60 km West Southwest of Surigao City, Surigao del Norte. Maximum sustained winds of 55 kph near the center and gustiness of up to 90 kph. Likewise, it is expected to move west at 25 kph. PAGASA warned that scattered to widespread moderate to heavy rains is expected over Visayas, Misamis Occidental, Dipolog City, Northern Zamboanga del Norte and Palawan. Residents of these areas must undertake precauitionary measures against possible flooding and landslides and coordinate with their respective local disaster risk reduction and management. Below is the forecast movement and track of 'Agaton' in the next 24h, 48h and 72h, image(s) courtesy of PAGASA. Note: This latest PAGASA Weather Update report for Tropical Depression 'Agaton' on January 2, 2018 will be updated soon as the administration release the next weather bulletin. Meanwhile, PAGASA added that sea travel is risky over the areas under TCWS #1 and seaboards of Northern Luzon and Southern Luzon, eastern seaboard of Central Luzon, and eastern and western seaboard of Visayas and eastern seaboard of Mindanao due to the surge of the Northeast Monsoon and TD AGATON.